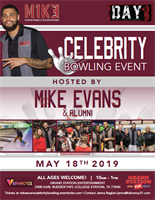 Texas A&M University former football player and current Tampa Bay Buccaneer Mike Evans invites you to our Celebrity Bowling Event on May 18th from 10 a.m. until 1 p.m.at Grand Station Entertainment. All ages are welcome! Reserve your tickets here. For more information, contact Jenna Raglani at jenna@vibrancy21.com. Need marketing help for your business but not sure where to start? Evolve Impact Group is proud to offer Bryan/College Station Chamber members our SMB Marketing Package. With this package you will receive the following products and services: FREE Marketing Consultation, 3 Months of FREE Digital Listings Mgmt ($300 Value), 50% off your first print project, and 25% off the setup of any digital marketing services. Contact us today to for more information or to claim this HOT DEAL!